Now, here is something you don't get to see every day. While passing by the Intel booth at MWC 2012, we spotted a group of Androids (okay, people dressed up in Android suits) dancing to a techy tune. Naturally, we took out our camera and decided to share the experience with you. So what could have made these Androids so happy that they decided to commemorate it with a dance? 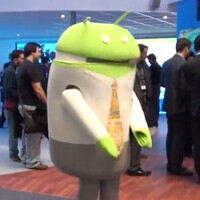 Could it be that the first Android smartphones sporting Intel hardware are hitting the market within several months? Feel free to check out the video below and share your thoughts with us in the comments. I hearby ban dancing androids from all of the internets. You're right; they should hook up with Ben & Jerry's. That way, Ben & Jerry's can give them some awesome names for future updates in return. that was cute hahaha! but i was amazed on the people who are dressed up with that costume for i know they been paid a lot of penny! by just simply dancing! haha and that suit seems to be hot! well pretty entertaining! thats more ok than to see a dancing apple. hahaha! hahaha...it's a really brilliant idea to create such a funny cartoon character & picking some weird names like ginger bread or ICS other than the apple logo for an example. that's wut i call "marketing". This years halloween costume!! A dancing apple would be too fat and get repeatedly stuck in doorways! !